HomeReviewsI really wanted Flippin’ Fantastic to work… did it? I really wanted Flippin’ Fantastic to work… did it? Not long ago I was presented to the Flippin’ Fantastic as someone shared a commercial about it on Facebook. I looked fantastic, so I quickly ordered two pieces of Flippin’ Fantastic. One for me, and one to give away as a gift. While waiting for my order to arrive, I looked around on the Internet. Could Flippin’ Fantastic be as good as promised? I was quickly devastated as I checked lots of Flippin’ Fantastic reviews on YouTube. 95% of them were telling me that this is a terrible product, and that it ain’t working at all the way it should. I probably had a feeling about that already, but it made me a bit sad to see that everyone said that this product was a real bummer. But, even though everyone else fails in succeeding with Flippin’ Fantastic, I had a feeling that maybe I would still succeed. I am not at all a talented guy in the kitchen, but I don’t like giving up, and therefore I imagine that I would try and try until it works the way it was supposed to. Before continuing, take a look at the following commercial for Flippin’ Fantastic in the first place. Before I continue, let me say that one should be negative and a bit suspicious as you see the clip in the start of the video. Take a look at the screenshot beneath from the commercial. You might be a lousy person in the kitchen, but making pancakes in a normal pan can be easily be done far better than this. A great way for the commercial to show how lousy the real world is (when it truly isn’t), and on the other side of the story is their fantastic pancake maker. But, is it truly that fantastic? 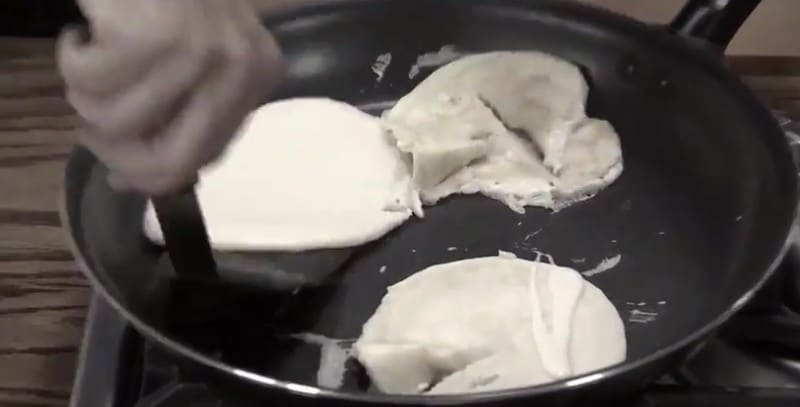 This is just too stupid… making pancakes normally doesn’t look like this! As mentioned earlier I really wanted the Flippin’ Fantastic to work. As it arrived in the post I therefore made all preparations in order to create some beautiful pancakes with my new kitchen tool. 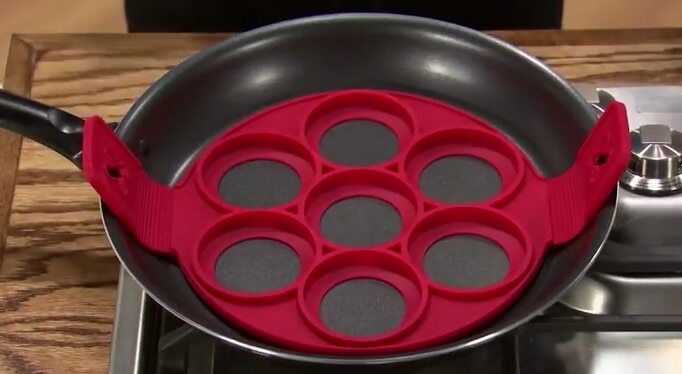 What I quickly discovered as the main problem, the biggest of them all, is that the Flippin’ Fantastic silicone mold doesn’t get stuck entirely to the pan. This leads the dough itself to flow out underneath the silicone molds, and thus everything is destroyed before actually starting. I tried placing the mold under pressure by heavy books for a long time to help the mold stay flat, and it actually helped, but not enough to make it work 100%. I also tried another method placing heavy products on the mold, and this helped, but it was quite complicated. 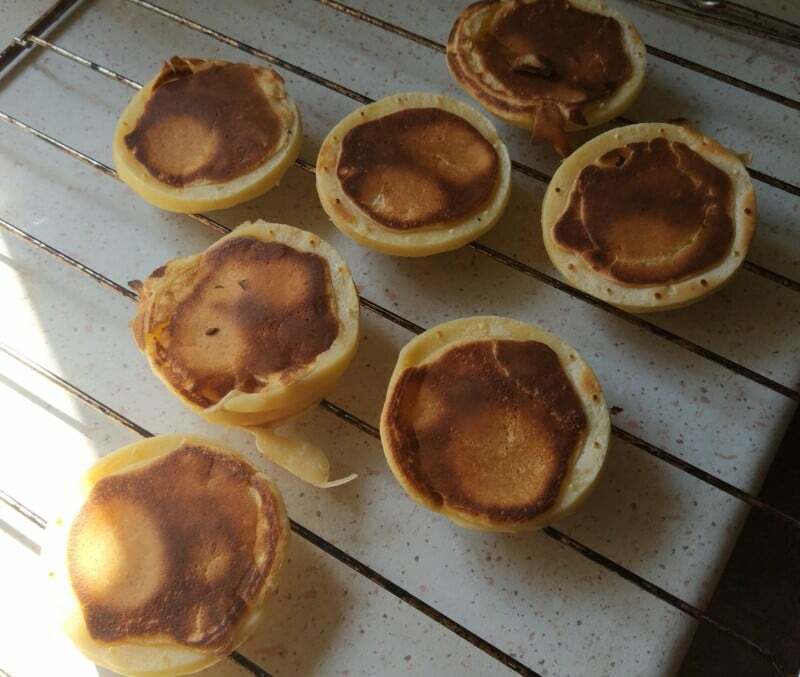 Now, even if I managed to get the pancake mold stay almost tight to the bottom, there are more trouble awaiting. First of all you need to get things heated evenly, because if you turn the mold too quickly, it will destroy everything. If you turn it late, then everything will be burnt. 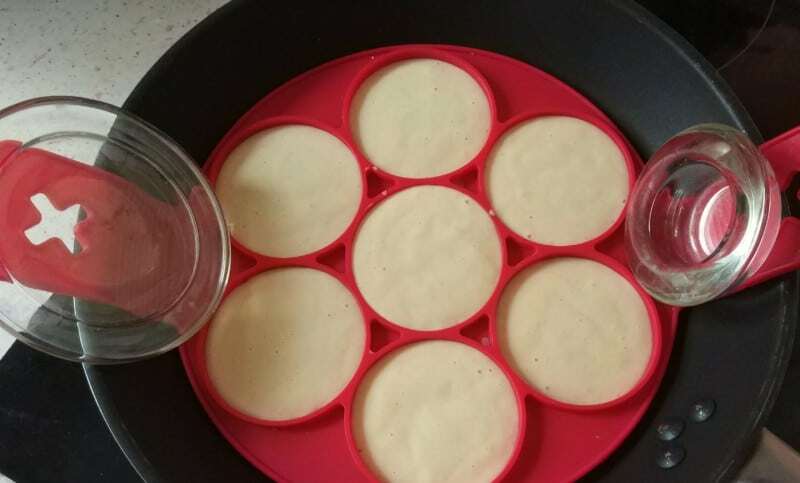 And since you are supposed to add the pancake dough quite slowly, there will almost be a minute difference between the first and the last pancake (especially if you need to manually help the mold stay stuck to the bottom of the pan), and this will of course create trouble later. As I have followed my own instructions so far, I am able to turn the mold around and it then looks something like this. The problem is just that it doesn’t leave the mold by itself, meaning that I manually have to push the pancakes to make them leave the mold. While the rest of the pancakes wait for this to happen, they get unevenly cooked and makes them yet again not 100% perfect. As I finish up the job, my end result looked something like this. If you take a look at the results above you will see what it looked like for me. I tried lots of different methods before it looked this good, but to be honest, I am not at all satisfied with this either. The ugly looking white ring around the pancakes shouldn’t be there, and it is simply way to much job making it look like this. It is much more convenient just using a pan and creating pancakes yourself, without Flippin Fantastic. You might not get a perfect circle pancake in that way, but you will not get that using Flippin’ Fantastic either. It also takes ages for the seven Flippin’ Fantastic pancakes to get finished, which means that I could easily make six bigger pancakes in the same pan in the same amount of time (or less). I would then make 3 pieces at the same time, and doing this twice, I would still use less time than I would making one portion of Flippin’ Fantastic. In the Flippin’ Fantastic commercial they also make eggs. I wasn’t that interesting in this function, but I though I’d just give it a try once. Again the main problem is that the mold doesn’t get stuck entirely to the pan. As a result it easily just turns into a giant mess. But, if you do anything in your power to keep the egg inside the mold, you will still have great trouble getting a good result. Either you will end up with a burnt egg beneath (still floating as you turn the shape), or you will have to wait for trillions of years for it to get cooked all the way through before you turn it, and you still don’t have a warranty that it will look and taste well afterwards. You can buy it on Amazon.de, but I wouldn’t. It is way to much job, for a poor result. Use your energy on something else, create the pancakes yourself, but do not buy this product. 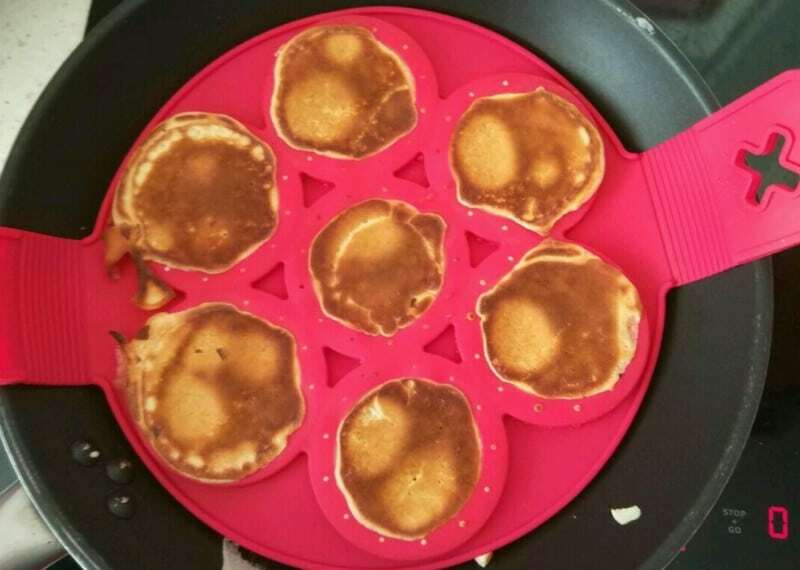 There might be other shapes working better than Flippin’ Fantastic, so if you really want to try, I would go for some other silicone pancake molds instead. But, keep your ship in some other direction than Flippin’ Fantastic, it will just cause frustration instead of happiness. The reviews out there ain’t scam reviews as they say that this is lousy product. It doesn’t work as promised. You might get it to work fairly well, but it isn’t worth the energy. What do you think? Have you tried Flippin’ Fantastic yourself? Do you agree with me? 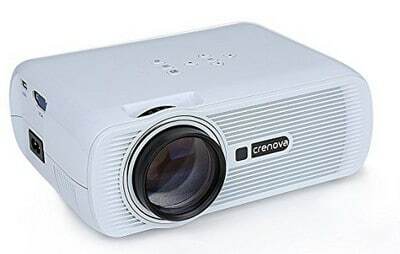 I would love to hear your thoughts on the product, and if you have any questions, please use the comment field beneath.